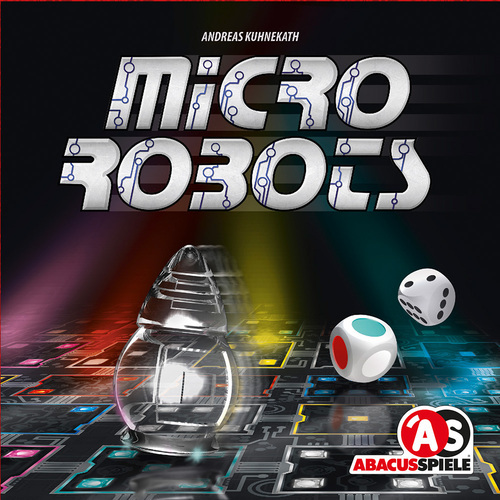 Micro Robots is a new small format game that is another take on the Alex Randolph classic, Richochet Robots. It uses the same basic mechanic of finding a path from point A to point B with a few twists. The board is a four part modular thing – one side with a black background and one side with a copper color. Each piece has a 3×3 grid on it, and when the four pieces are put together, there is a 36 space grid; one space each for six colors numbered 1-6. To start the game, the two dice are rolled. One die has colors on it, and one die is a traditional d6. The combination of these dice will pinpoint one of the 36 spaces on the grid. A large transparent disc is placed on this space so that all players can see the starting point. The dice are rolled again, and a target chip is placed on the new spot. At this point, all players try to devise a valid route from the starting space to the target space. The task here is not to find the shortest possible path (as you would in Ricochet Robots) but instead simply finding a valid path in the quickest amount of time. Once that valid path is found, a player yells out the number of steps it takes, and then proves the path by drawing it out on the board. As long as the path is valid, that player wins the round, takes the target chip as a VP marker. A new round is started using the old target space as the new starting space. So how do you move around the board? A valid step is one that moves to a space that shares either the color or the number of the space where you moved from. So, you could go start on a grey 2, move to a red 2, from there go to red 4, then to yellow 4 and finally to the target of green 4. You must always travel in a straight line, and you are not obligated to stop on the first space that matches one of the movement criteria. The game continues until someone has 5 victory point chips (or when the entire supply of 25 chips is taken). 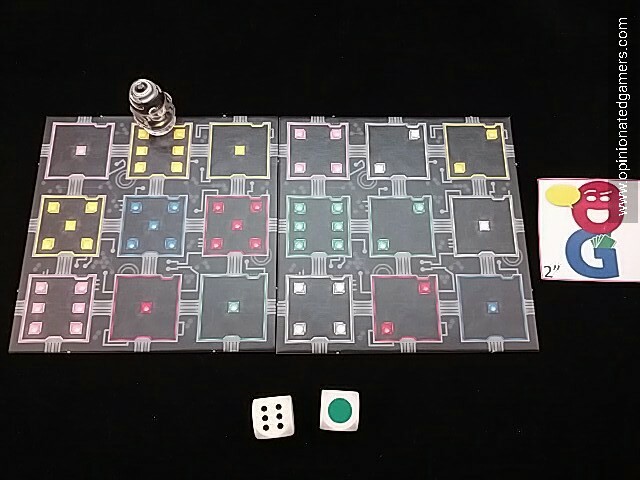 There is an advanced variant where the dice are rolled twice – once to give a midway point and once more to give a final target. In this more complex version, you must navigate in your hard from the start space to the midway point and then, from there, to the target space. Again, you do not need the most efficient route, but simply the quickest route. Below is an example half board. Can you get from the yellow 6 to the green 6? 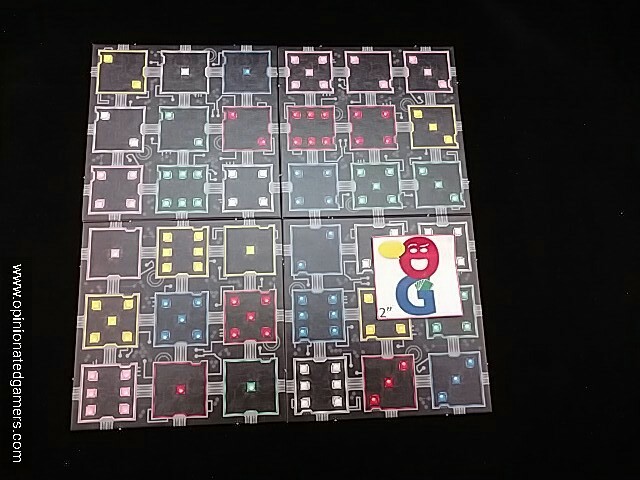 Micro Robots is a nice little pocket sized puzzle game that I played on numerous occasions at the Gathering. It is quick to teach, and most people are able to jump in a game quickly. The rounds can be super fast, sometimes as little as 5 or 10 seconds before someone is able to come up with a valid route. We have chosen to use the suggestions in the rule of not marking the target space with a chip, but rather simply rolling the dice and letting everyone figure out where the target it is on their own. In that way, no one has advantage by blocking the board with their hands as they try to put the chip down. We did find that the board was somewhat “memorizable” after a few rounds – that is, players tended to remember paths that they had created in previous rounds; this, in turn, made later rounds go even faster because part of the solutions were already remembered. Though I’m not a fan of house rules, one of the guys proposed a variant where one of the board pieces was rotated 90 degrees each round to shake up the board a bit. That seemed to make it a bit more interesting. Like most puzzle games, this one suffers from the same speed superiority issue (a term of my own making); in speed games, a player who might only be 5% better at the actual skill will end up winning a disproportionate percentage of the rounds because there is no reward for second place or coming close. Only the fastest player will win the point. That’s not necessarily a knock against this particular game, this is an issue that I have with almost all puzzle games where the quickest player wins. With rounds being so short, if you were playing with 4 or more, you could simply have the winner of the previous round sit out for the next one to allow some spreading of the victory chips. Or, you just enjoy the 10 minute game for what it is. In the end, the rounds are short, and the game proved to be a nice filler or warm-up game during the convention. I know that my copy got a lot of play during the week as it was always somewhere else other than on my stack of games. Dan Blum (3 plays): This probably works fine as-is (or with the rules’ suggested mid-point variant) for people who like simpler puzzles than those posed by the original game. For people who like the original it will tend to be too easy. We enjoyed it more when we played with both the mid-point rule and the house rule Dale mentions where the destination board is rotated 90 degrees after the solution is found. We also enjoyed it more when we used a timer and allowed shorter solutions to be found as in the original game. Of course at that point one could just play the original game, but this is a nice change of pace if you play the original a lot. And there are rules for using the transparent robot in the original game, which is nice. I didn’t get my thoughts in in time, so I’ll add them quickly here.